This article is a continuation of a series whose most recent entry was the January 2018 update. 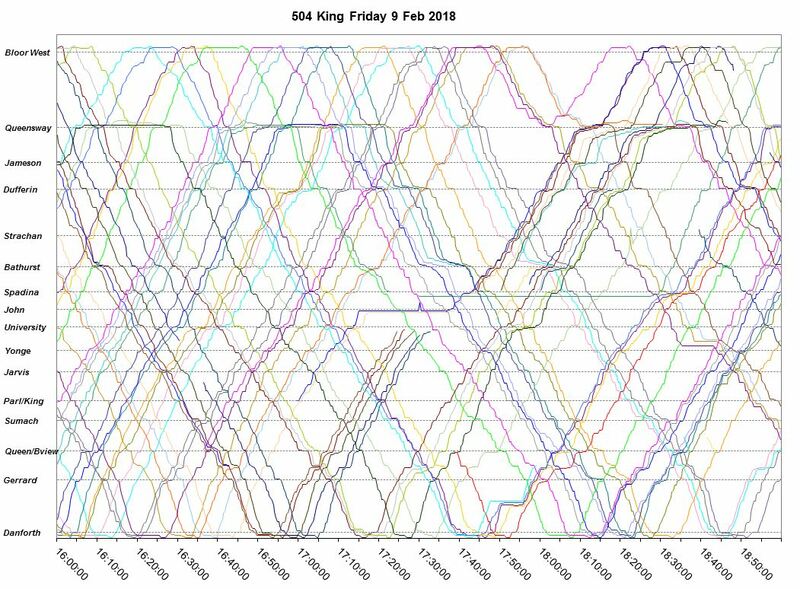 There is not much new to report for February, and so this post is mainly a collection of updated charts. Please refer to the previous article for greater detail about their content and for links to earlier pieces in the series. Weather for February was less glacial than in January, and there were two periods of precipitation on Feb 10-11, and again on Feb 19-21. However, the temperature was higher for the second period yielding mainly rain rather than snow. 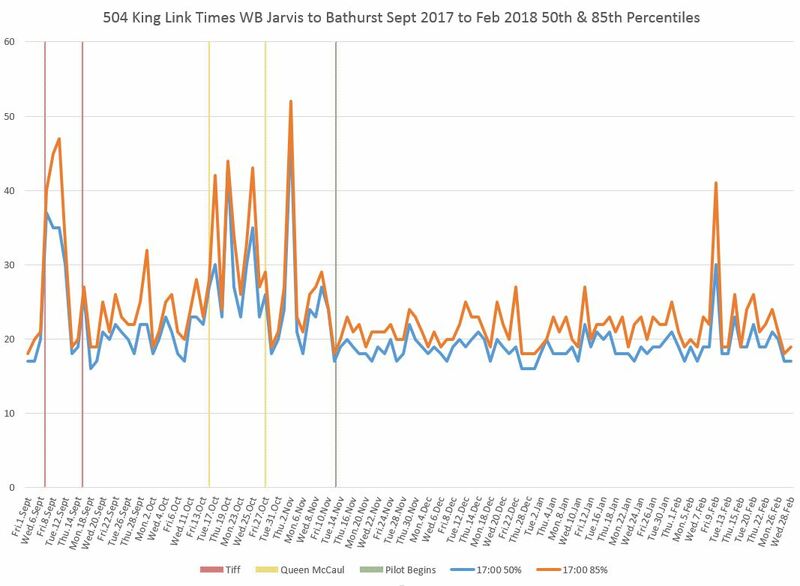 The pattern of running times between Jarvis and Bathurst changed little during February although there were a few spikes, one of which appears in the updated version of a well-quoted chart from the January post. The spike on February 9 was caused not by the weather (snow did not arrive until the 10th), but by a collision that blocked service westbound at John Street. A few cars were trapped, and their longer than normal travel times created the spike in the chart above. Most cars diverted via York, Queen and Spadina. The full sets of charts are below. On February 20, 2018, there were no trips in the early evening on King Street. This was the period when the streetcar system was shut down due to premature wear and failure of the carbon shoes on Flexity trolley poles brought on by a combination of a new supplier and the rainy weather. 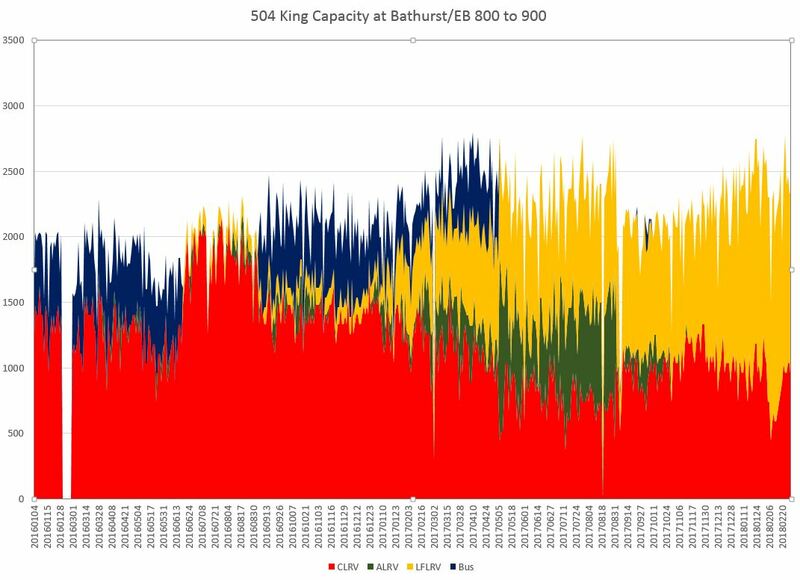 The service capacity on King continues to grow as more Flexitys operate on runs formerly served by CLRVs. Schedule changes on 514 Cherry are not reflected in the capacity charts because they only affect off-peak service and do not add to peak capacity. The introduction of 503 Kingston Road service westbound on King at Yonge adds to the capacity measured there, although the added cars only run as far as Spadina. 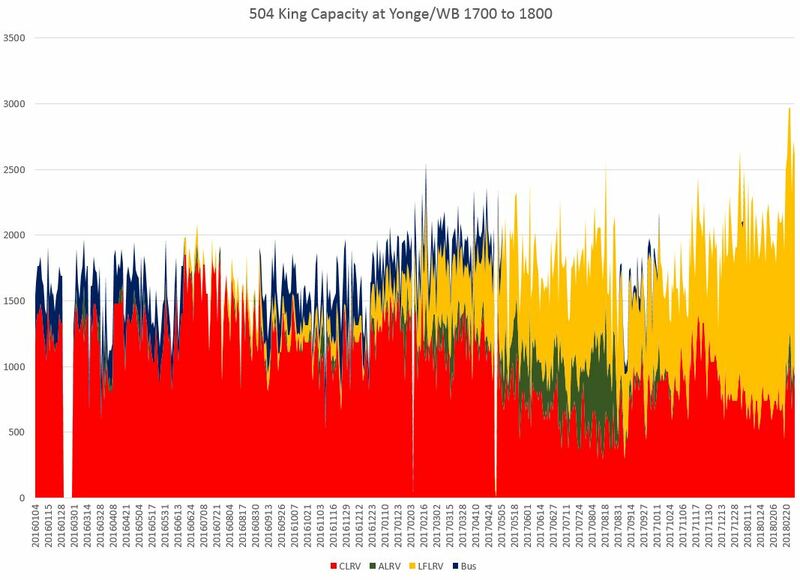 The capacity at Yonge westbound in the PM peak, measured using service design values for each vehicle type, now comes close to 3,000 per hour, although this happened on a day when some 504 King runs were operated with ALRVs rather than CLRVs. This update does not include headway reliability data as I plan to examine this issue for many routes in separate future articles. This entry was posted in King Car. Bookmark the permalink. Not to be too pessimistic but I will be amazed if these articles show that the TTC has finally get control of headways – even those for departures from terminals! My observations on from the last two weekends downtown show there are still some 10+ minute gaps in service. Steve: Yes, headway reliability remains a problem especially on weekends. I am working on articles about this not just for King but for other routes. It was interesting seeing system and network effects play out in real time last night after the Leafs game ended. The TPS now close York Street from Front to Lake Shore for about 30 minutes from the end of Leafs and Raptors games at the ACC. I suppose the idea is to allow the bulk of the crowds to more quickly disperse out of the area. Naturally, an unplanned an unpredictable closure like that leads to a lot of confusion for drivers. Traffic heading down University is suddenly stuck with a decision about where to go at Front Street. With all the pedestrian activity, it leaves a window for only a few cars to actually turn left or right at Front on each light cycle. This further causes traffic to get backed up far north on University. Last night, I was waiting at King and University for a 504/514 after the Leafs game. The backlog of cars was so bad they started blocking the intersection at King, like during rush hour, preventing the streetcars from actually passing through University. I couldn’t help that think that was a 30 minute window where service was basically as bad and unpredictable as the pre-pilot days through something that was of no actual fault or control of the TTC, and this is probably happening for every event at the ACC now.